Menorca is a beautiful Balearic island; and with more beaches than Mallorca and Ibiza combined, it is serious competition for its more famous neighbouring islands. Known as the more laid-back island, it’s perfect for families with young children or just visitors who want a relaxing holiday and slower pace of life. The resorts tend to be small and occupied with holiday villas rather than large hotel complexes. The most popular coastal resort is probably Son Bou / San Jaime, with over a mile of white sand, perfect for sun-worshippers! It is not just good for beach-goers though, the newly constructed coastal path, Camí de Cavalls, is ideal for walkers, too. The whole of Menorca has been classified as a biosphere reserve by Unesco because of the striking wildlife and natural surroundings. On a walk around, you could see booted eagles, red kites, Egyptian vultures and even osprey! 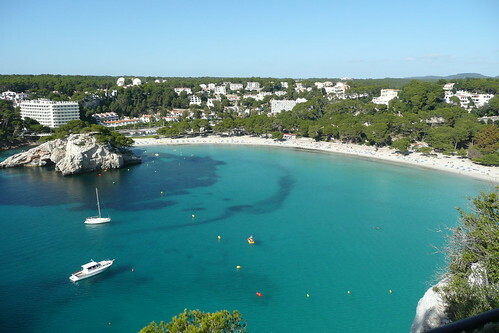 If you aren’t sure where to start, you could book a guided tour with Walk Menorca to ensure you see the best there is. The capital, Maó, spreads along a cliff above the harbour with bars and restaurants. The old town is filled with small plazas and a market to explore. Across the other side at the western most point of the island is Ciutadella, a picturesque old town with cobbled streets, harbour, Gothic cathedral and museum. If you like a fiesta, however, then go around the Saints’ days between June and September to enjoy the buzz and jollity of each town’s special programme of celebrations. For more information about up-coming events around the year, visit Menorca Live, which I’ve found rather helpful for finding things to do once you’re there. We have many holiday villas in Menorca, but if you’d like some inspiration, then you won’t go far wrong with this pretty and spacious villa in Puerto Addaia. The villa sleeps 6 and has 3 bedrooms (2 double & 1 twin – both doubles have air-con). There is a balcony overlooking the pool, and a large roof terrace with lovely sea views. There is a main bathroom, a fully equipped kitchen, lounge with Sky TV and French doors which open onto a partially covered patio with built-in barbecue and large, extendable sun awning. The pool is excellently maintained and has a children’s section. The villa is also close to local shops, restaurants and marina. Also close by is Arenal, a beautiful beach. For this villa and many more across Menorca or other holiday destinations, check out our main website for details.